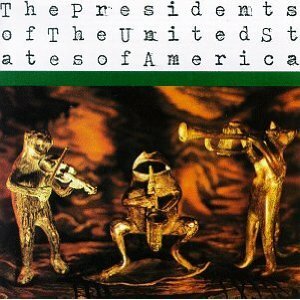 Ok so this is going to dive back into my teenager hood on this post, one of my favourite albums to come out in the mid nineties was The Presidents of The United States of America‘s self titled debut. Hailing from Seattle there was something which really made the band stand out from crop of alternative rock or pop punk. Maybe it was that they some how managed to straddle the line pretty directly between the typical alt rock sound and the humorous energy of pop punk, with out them ever descending into bad toilet gags. Or it could well have been the fact that they play with 2 string and 3 string guitars. Musically I think they were too clever to really be folded into the viegn of Green Day and Blink 182, its like as if they took the geek book from Weezer and added in a more firmly tongue in cheek aproach. They had the a way of telling humorous kind of geeky looser stories, using sometimes metaphores like stuffed animals, Dinky toys and messing around in sand pits. Their debut came out in 1995, so I would have been about 13, when it came out. This was back when Woolworths used to dominate the high streets ans a thing called the internet had not been invented yet and a thing called the CD. You used to also be able to get music on cassette tape, you know the thing which was designed to take over from Vynil but never really did as it lacked a certain something. I actually own a copy of this single somewhere! although I dont know where. Riding back in my dads car with this on in his tape deck. we both nearly instantly fell in love with it, you see there is a certain charm that meant that it crossed both of our generations. I actually ended up doing a cover of their biggest hit single Peaches fora school music project and boy did I destroy it with my horrific voice. You have heard the term drowning cat right? well try strangling it at the same time and you will get my teenage vocal prowess, oh yes. You probably are thinking why am I writing about this? and why arent I writing about some new band on the block? Well its because simply no one rocks like the Presidents, that and the fact that they are doing the entire first album live on their current tour and the played in Bristol. I turned up really early because of having no money and I met Chris Ballew the bands lead singer and he came across exactly like how my friends in Buckey had described him. That being extremely friendly and very personable. He managed to get me in. Feather Plucking was my favourite song off the album, I was there singing the lyrics back right into Chris Ballews face and him name checking me during the song. Not only did Chris get me in but he and the other PUSA members had a little suprise in store, as they whipped together a song about me. This was more then a little flattering considering I kind of idolised them as a teenager. I urge everyone to see The Presidents live, they are just so much fun.